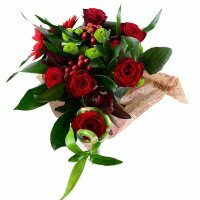 Male bouquet looks exotic and pretty particular, at the same time a strict design turns it into a pertinent present for different types of occasions. 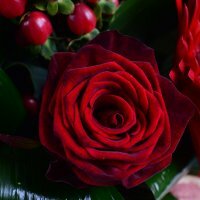 It will become a great surprise if it’s chosen on International Men's Day, Birthday, an anniversary, and other particular days of his life. 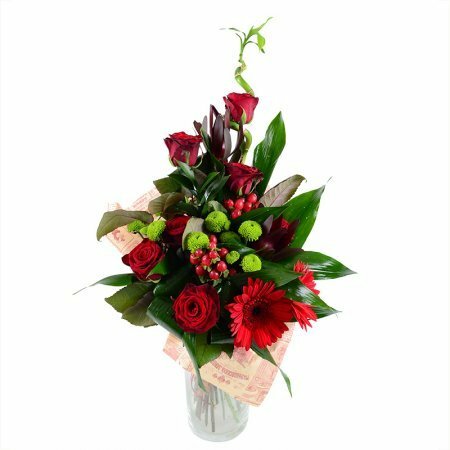 This bouquet composed of bright luxurious gerberas and amazing dark red roses. 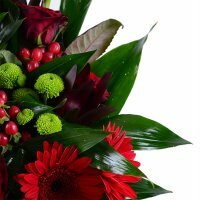 But what makes this bouquet so special is velvet leucadendron and green chrysanthemums in addition to refined bamboo branches. 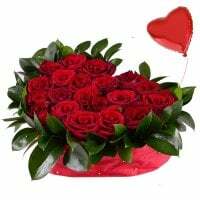 With a bouquet like that one, you could release your unexpressed feelings to a man you like, your loved one, a colleague, a director or a favorite teacher. Attention! Bouquet decoration may differ from the images displayed on our site. 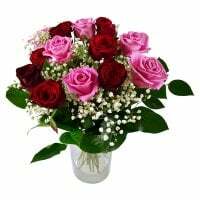 The value of the vase is not included in the price of the bouquet.